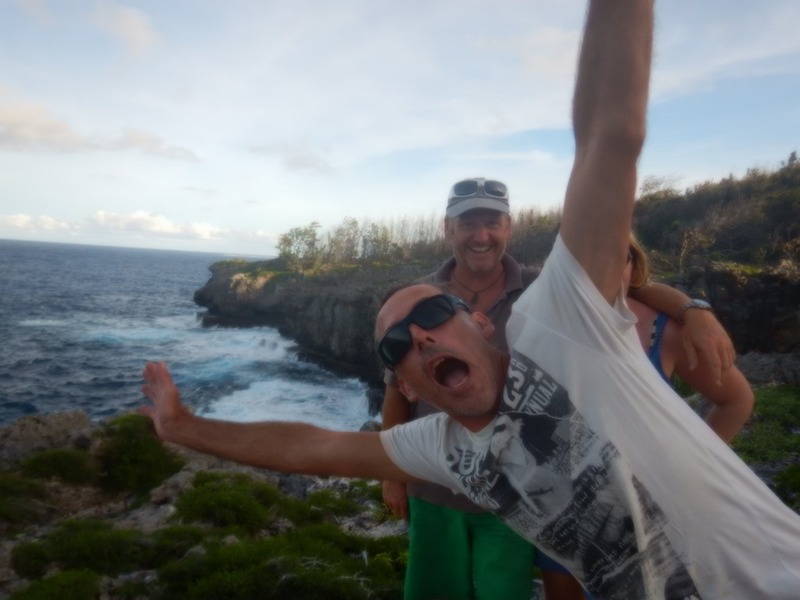 We sailed the 250 miles or so from Niue in moderate seas and winds in two days. The first 36hrs were running and we managed a few hours up with the parasail but with no moon, overcast and the odd squall, we choose not to run it at night. The last night was under plain sail after the wind went back into the SE and we just had the angle to fill the genoa on a broad run. Pleasant sailing. We even manage to catch a fish! 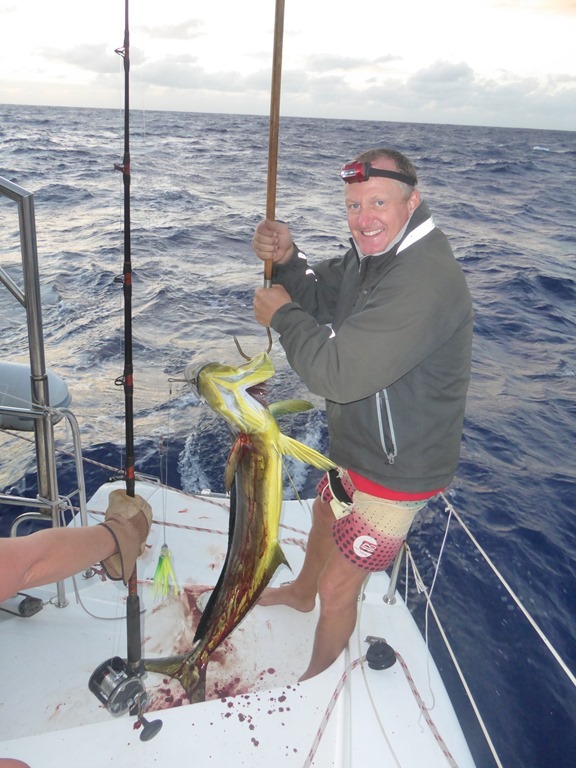 A lovely big Mahi Mahi threw itself on our hook. It took a bit of time to get it on board but it gave us meat enough to feed Be and Be and us twice, Shane, the Irish solo sailor we last saw in Raiatea and the crew of an Aus boat called Persistent Shift, another Lavezzi. It tasted wonderful cooked in sesame oil and S+P. 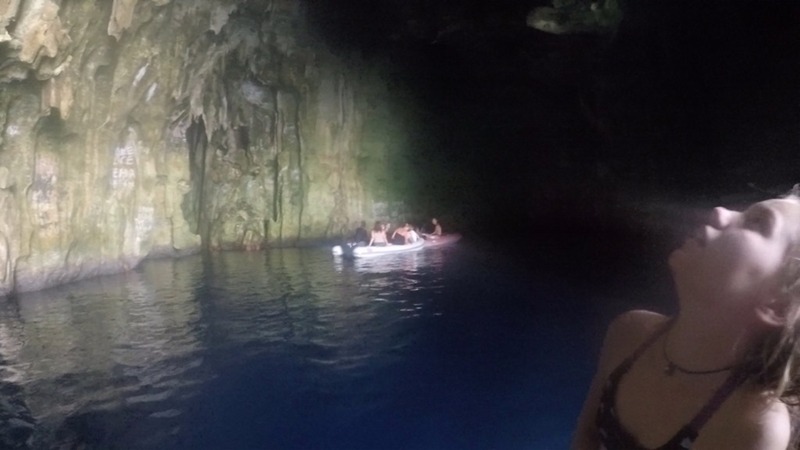 We reached the Ava Fonua Unga pass on the E side of the Vava’u Group, the northern island group of Tonga and went through the shallow pass without difficulty. We had been warned that our charts might be significantly off but Navionics seemed to roughly accurate. 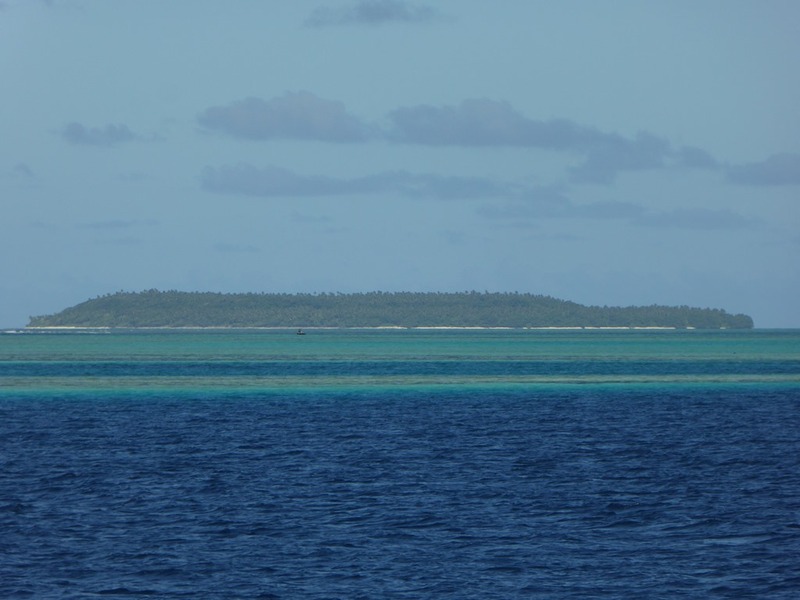 There was a little reef to avoid on the inside but after sailing in the Tuamotus, we were comfortable reading the seas colour and recognising the dangers. It was an easy entrance in the conditions we had. NB. We have found that the charts are generally accurate but there have been some howlers. Most reefs are marked but there are omissions and the depths shown must have been guessed at in places. The call is easy. Travel with a high sun and be suspicious always. We arrived on Sunday afternoon and anchored in Port Maurelle on the island of Kapa, a lovely bay where the first Spanish sailor put in for shelter and to water back in 1781. There was a spring running down the hill, used by Maurelle and until recently; the locals. With modern plumbing and rain catching tanks being now used, the spring has been left to overgrow and now feeds a swamp. It was great to listen to the songbirds, the first we had heard on the boat for a long time. As dusk fell, the kids got really excited to see huge fruit bats flying overhead, heading back to their roost. Be and Be arrived mid afternoon having had a few problems with their main, some baton cars blowing up on them necessitating a move to the W of the island to find sheltered water to get the main down and sort things out. They have had to order a couple of new cars, thankfully finding replacements in Australia so they should have less problems and wasted time than we did when we broke our cars going in to Cuba in 2015. 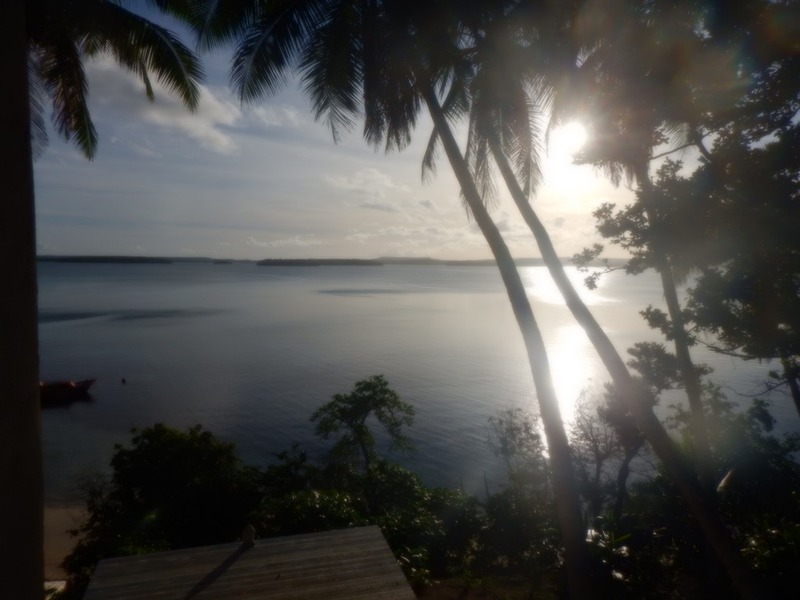 On Monday morning, we moved up to Neiafu, the main town and port of entry for the Vava’u Group. We waited a little while at the rough dock shared with the fishing fleet for the Customs, Immigration and Health staff to visit us. We had no problems that couldn’t be settled with a smile, cake and coffee. We were cleared in without issue. I took the chance to run across to “Problems in Paradise?” , the small engineering business in a boat shed beside the dock and was able to get Ian, the excellent mechanic to come and have a look at the genset. Lou ran into town and got some local wonga to pay our entrance fees, then found where the laundry was and whilst I waited for Ian, disappeared to look around. 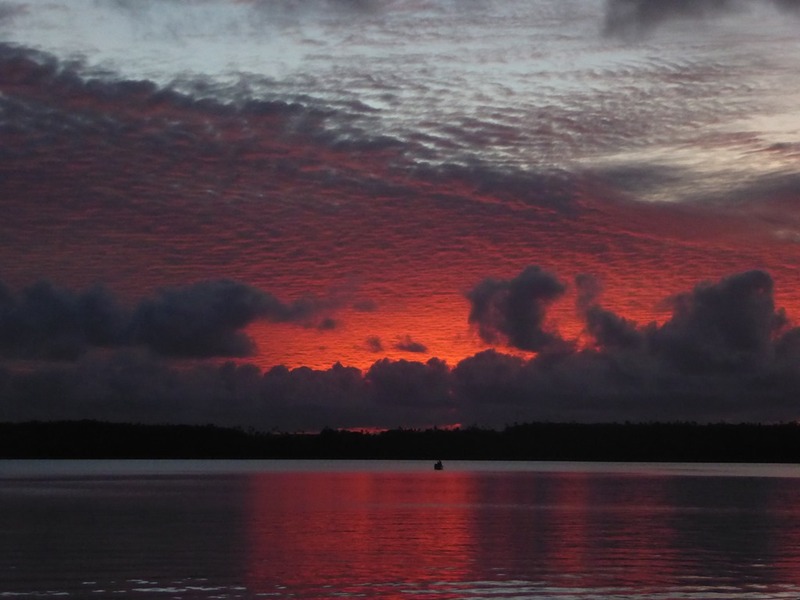 Neiafu is fairly large, containing the majority of the 16000 inhabitants of the Vava’u Group. There are a number of small supermarkets, all seemingly run by the ever present and hard working Chinese, several slightly seedy bars and a couple of banks. The town has a down beaten look and there is not a lot of money evident. The largest building in good nick seems to be a government one, ironically watched over by an enormous derelict colonial house which probably had the same function 50 years ago. There is a good sized mooring field, some run by Moorings and more by Beluga Diving as the depth for anchoring in the bay is a bit too much for most, mainly between 50-75m. Call them on Ch 26 or 09 for a ball. 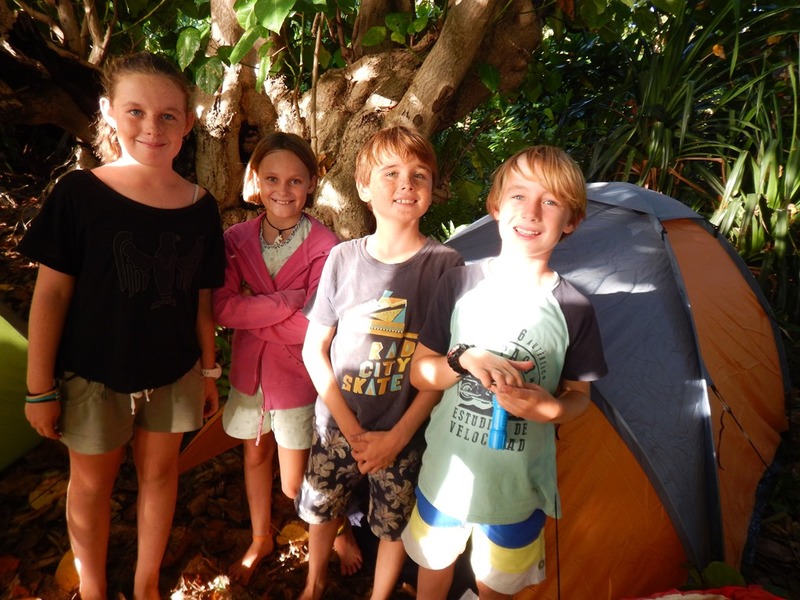 After Ian had come and gone, I walked up to find Lou, Peta and kids settled in in the Tropicana Cafe, washing on at a very good $18Fijian per load for a wash and dry, beers in hand, looking happy. The Tropicana is the main dropping in place for yachties,has good internet, and Greg will accept mail and parcels on your behalf. He can be called on Ch26, the channel which is rebro’d around the whole of the island group. For those needing new films, he has the largest collection of films and series that I have ever seen to exchange. The food is pretty good too. He can supply flags, charts and is a good source of info for your stay in Tonga. We had been told that Tonga was useless for internet, reason enough for us to get all our advance notice paperwork for Fiji in all the way back in Bora Bora. I’d like to announce things have changed massively for the better. We bought a phone sim card for $10 which gave us 2Gb of data. The 3G has been excellent for most of our sailing through the islands and the speed is at least to FP standard, generally much better. There was some free internet at a couple of the cafes but it was far easier (and cheaper) to buy the sim card and then hotspot it. The local provider is Digicel and the shop is found in the middle of town close to the Customs, just up the hill from the market. We spent two nights on mooring balls, moving to the wall during the day so Ian and I could work on genset. In the end, he did the drilling out and fitting of new stainless steel studs and I did the rebuild, new gasket, replumbing and a change of impellor too. Once everything was back in place, the sound of the genset running sweet and clear of smoke brought a smile to my face. One less thing to worry about. Shopping proved successful as well. 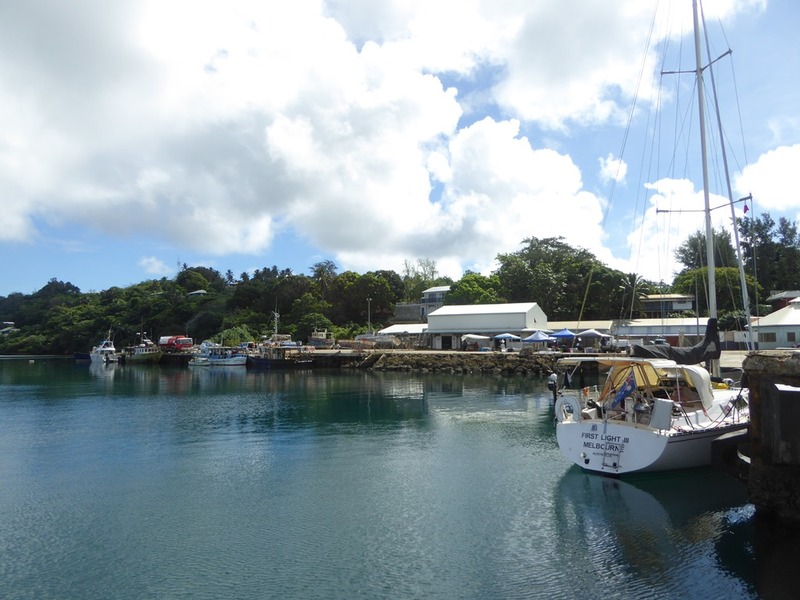 Last year there had been problems with delivery ferries making it up to Vava’u and shopping was difficult. The problem seems to have been fixed and this year there are multiple ferries a week. There is a good selection of fresh, canned and dried food and there is even an excellent deli run by a couple of Canadian settlers who make the best sausages we have tasted in the Pacific. Sorry NZ but your sausages really are crap in comparison…. We watched the arrival of more and more World Arc Rally boats. This rally takes you around the world in about 15mths and we have been managed to be just in front of them since Bora Bora. I talked to one (professional) crew member and his comment was that he was sailing then provisioning then sailing, very occasionally being able to sightsee for a day. I get the sailing bit – around the world will always be a massive achievement – but I rather think not experiencing the cultural differences of all the places you pass is somewhat missing the point of travelling. Just my opinion, of course. As the original fleet was more than 30 and it has dropped to 20, I think some folk might just have decided that too. They will be here in Tonga for a few days, then Fiji then Darwin by the end of July to be able to cross to Cape Town in season. We won’t have left Fiji by then! When we were in Panama last year, we had been given a copy of the sailing guide Moorings give to their Tonga customers. It has proved to be very helpful. 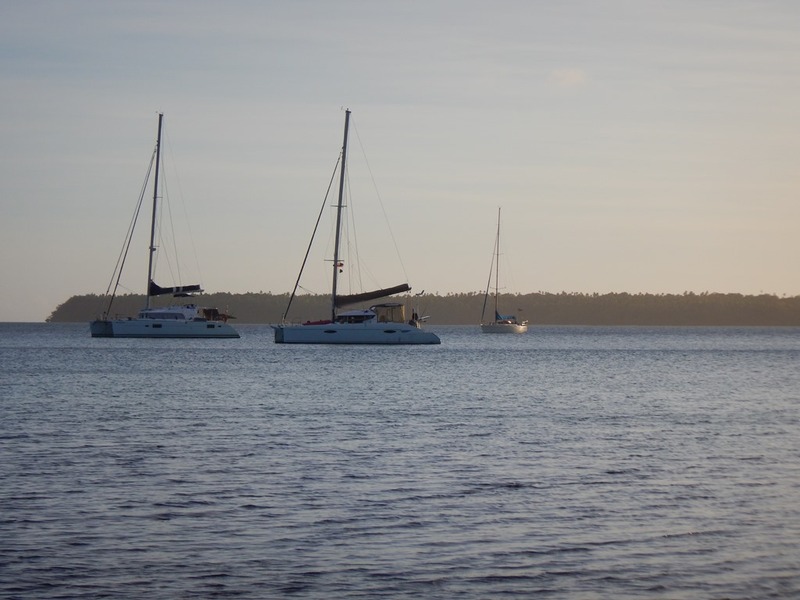 As the water is very deep for the majority of the Vava’u area, Moorings has put in buoys in the safe anchorage spots that they recommend. Although it means less clear anchoring areas, it is protecting the sea bed, so we didn’t feel bad in picking them up when we saw them. They all seem to be in reasonable nick but I’d prefer to be on my own anchor if the wind was blowing in hard. The sailing reminded me very much of the BVIs but better protected and less civilised. This is not a swept up tourist destination; rather an isolated gem of a cruising ground. Load up when you arrive as there are no other shops and don’t expect the beach bar life of the BVI. The water is wonderfully protected, the scenery is beautiful and there are few people here. We moved around to join Sangvind, last seen at Raiatea at a small island between Mafana and Ofu, where some old friends had taken up residence on an island they have leased. To reach them , we went through through the Fanu Tapu Pass. The pass has no markings anymore (there was supposed to be three of them) and you need to read the reef carefully as you make the last turn to 010Mag. Turn early and you will find yourself dodging bommies. A few miles N, we anchored between Mafana and Ofu in about 25’ of water on a sand bank between two deep patches. We had one night there and moved even further E to the island of Kenutu, at a sheltered anchorage at 18 41.967S 173 55.759W in 20’ of water. 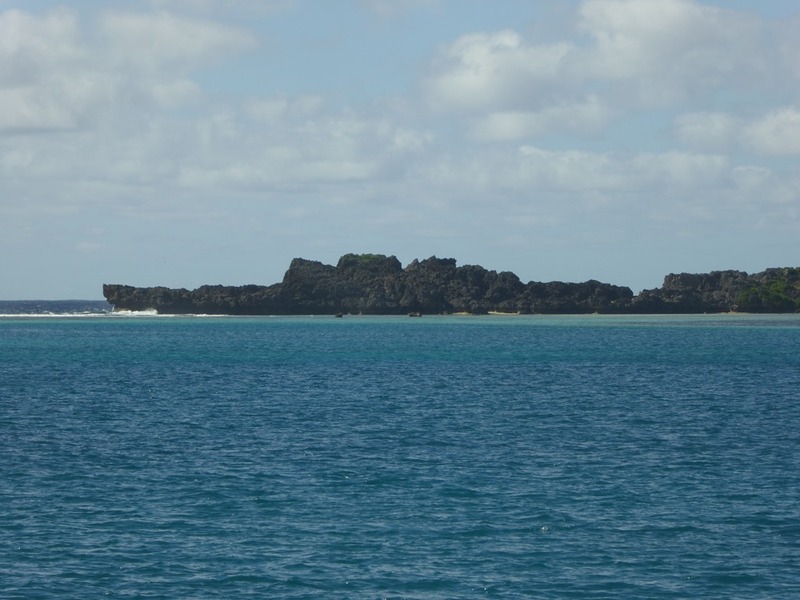 A strange rock formation at the S end of the island looked very much like a warship. You need to be a little careful going from the channel to the anchorage for the last half mile E but in good light it should pose no problems. 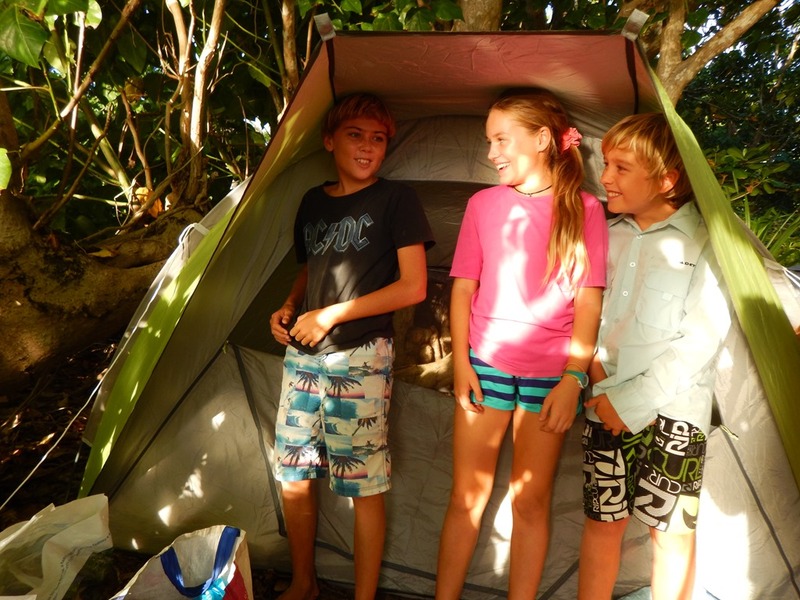 The kids went ashore and camped there for two nights. We got a decent fire going, heating the kids’ food on it and of course, had marshmallows, found in one of the supermarkets. The adults retired. 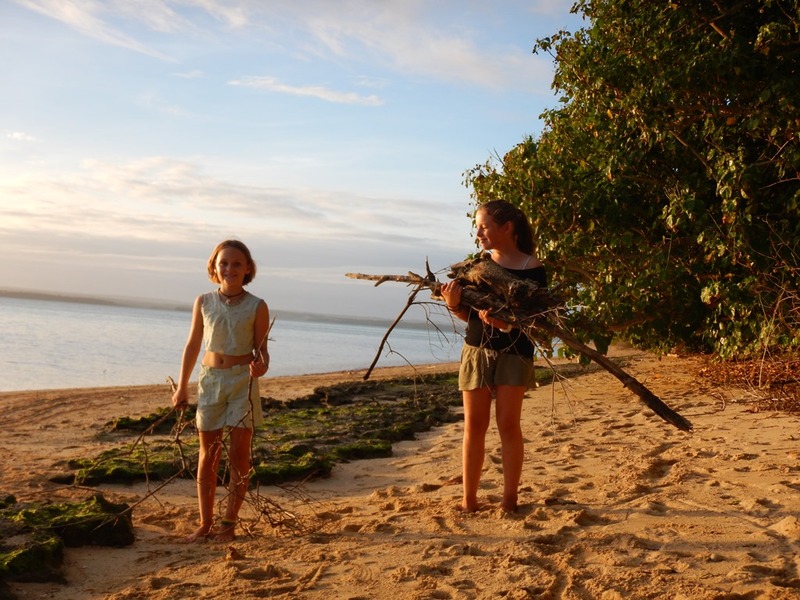 Bliss and quiet on the boats…..
At the next island up, Umuna, we explored for a fresh water swimming cave that Sylvia remembered from their last visit to Tonga some ten years ago. After one unsuccessful climb up to 30m cliffs, we moved up one bay and met an Aus couple, Mark and Annie who had built a house on the island and were planning to spend large parts of the year there. The view W from the house was spectacular and they have put in an impressive amount of work to make a garden from the jungle surrounding them. Sadly a tree had fallen across the entrance of the cave which was just behind their house and it was suggested that it was too dangerous to enter. As they had rights for the whole island, they had constructed a walkway through to a decked area on the E side of the island and we explored that too. What a sunrise from there must be like………. 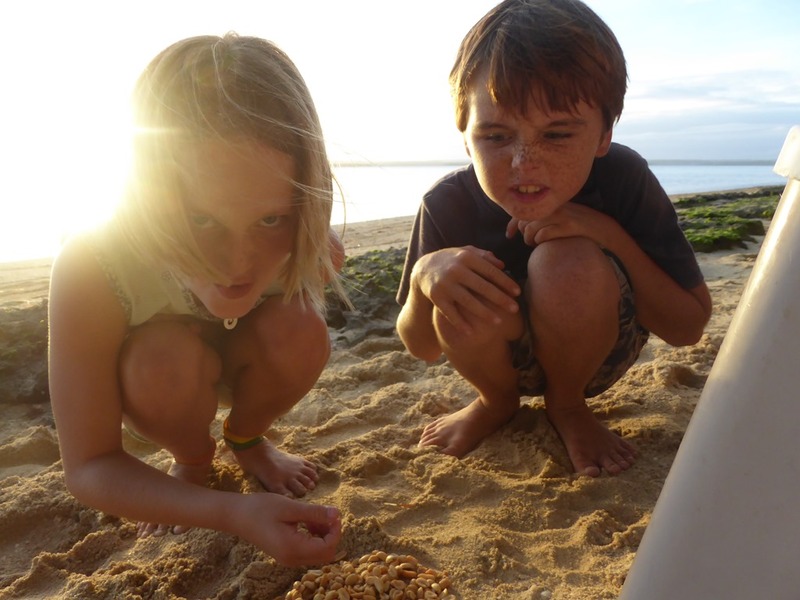 The kids of course charmed Annie but the find of a dead rat was infinitely more interesting to them than the views! Our thanks to them for allowing us to wander on their land. You might remember that my log and depth thing had stopped working due to a immersed and rotten connector between the data cable and the bus. I had attempted to clean it out, drilling out the old screws and wire so we could reconnect it. Geoff, a professional electrician with his own business back in Aus spent some time expertly soldering wire into it before one of the connector male spines maddeningly broke off, frustrating both of us. In the end Geoff hot wired the data cable directly into the bus connector, wrapped it with electrical tape and tied it up in a plastic bag. We switched on and voila! Depth, log, true and apparent wind all back up and showing. Two positive results in two days! My thanks to Geoff for a lesson on electrics. It is always good when someone with the knowledge can show you the way. After a good time playing Robinson Crusoe, we headed round to meet up with Ben and Lisa, friends of Sylvia and Frans who had invited us all to a party with the Peace Corp staff for the area. Having been abandoned by the kids (“soooo much more fun on Be and Be or Sangvind” ) Lou and I went for a sail – an actual sail – just for the sake of it. 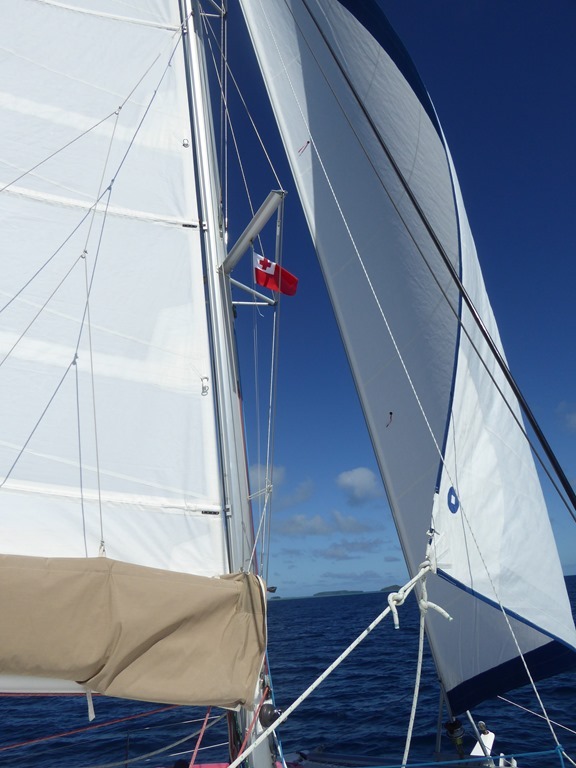 We tried to remember the last time we sailed for fun rather than to go somewhere and we think it was in Grenada…… The wind was light and the sea flat. We even enjoyed beating across to the reef pass which we sailed through. We sailed to Tapana and stopped for lunch, then had another great relaxed sail to Matamaka, the village the Peace Corp are based at. We picked up a mooring ball just off the jetty. Sangvind appeared with another yacht following. As they passed them going the other way, they saw they had kids and invited them to the party too. 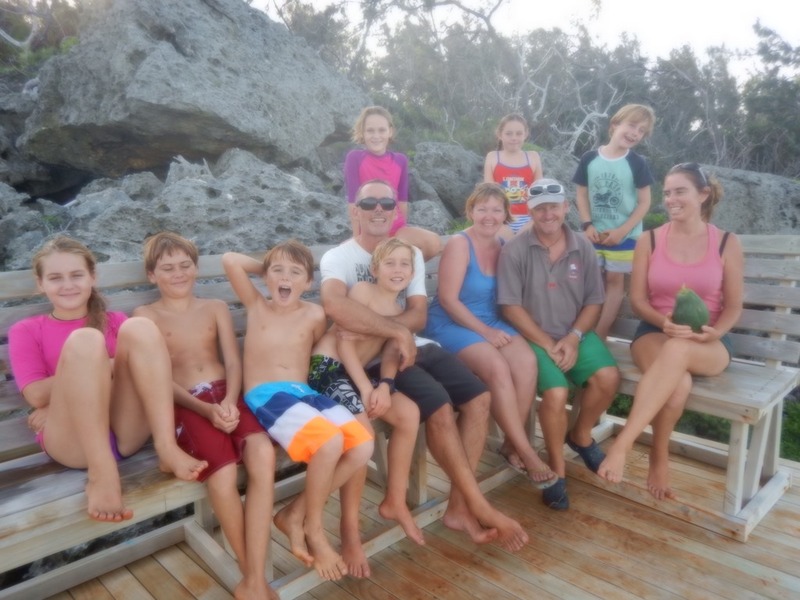 The Nelly Rose, an X-Boat from NZ had two kids on board, Ollie (9) and Alana (8). They will be sailing Tonga and Fiji this season. Navionics says we picked up on a reef. We were definitely in 30’ of water. The evening was great fun, sitting outside in the grounds of the Corp’s compound and the music, courtesy of Frans’s guitar playing, was excellent. We slept late the next morning. We moved so we could be out of sight for the Sabbeth and returned to Port Maurelle, just a couple of miles away with the boys from Sangvind and Evie and Harry from Be and Be (“soooo much more fun on your boat…….” – there is theme going on here) on board. I gave the kids the collective task of getting us there without hitting anything. Between the four of them they did a good job. Port Maurelle was very busy with lots of the ARC boats in. We anchored cheeky close to the reef on the S side of the bay in about 9’ of water. Pesto moved around to join us too. We made ourselves at home and created noise! Ten kids playing exuberantly made perhaps more noise than one or two boats liked. I’m afraid I didn’t care. We visited Swallow Cave, set in a cliff a mile from the anchorage. It is large enough to drive the dinghy in with two large water chambers (sadly decorated with lots of graffiti) and another dry that you would have to climb to. We decided not to explore it as we watched a water snake slither over the route we would have had to take. Unfortunately a little bit of tomfoolery on the Be and Be dinghy meant a lost mask overboard. Geoff tried to dive for it but we measured the depth at about 16m, too deep for either of us to get down to comfortably. We went back the next day and dived for it with a tank on. 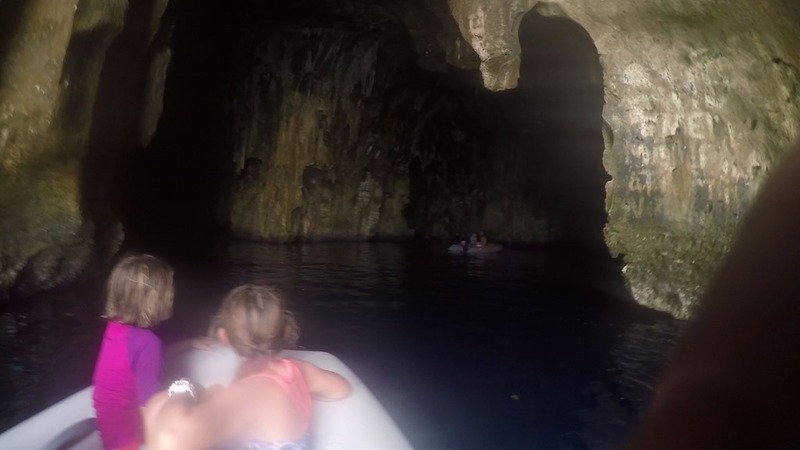 We snorkelled outside the cave at a patch of reef. It had a good drop off to about 25m and vis was around 50m, more than we had seen so far in Tonga. 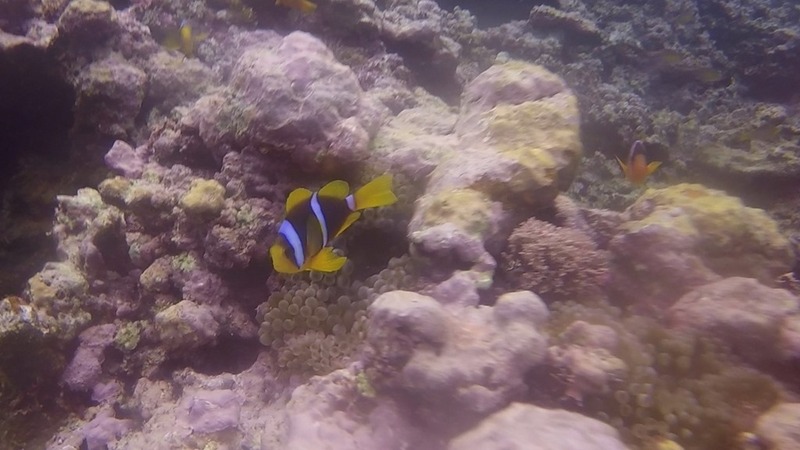 There were a small number of reef fish, a few patches of anemones with their resident Orange-finned Anemonefish, the first Barracuda I had seen in a long time but the coral was very dead. Our last full day was wet as the weather changed. 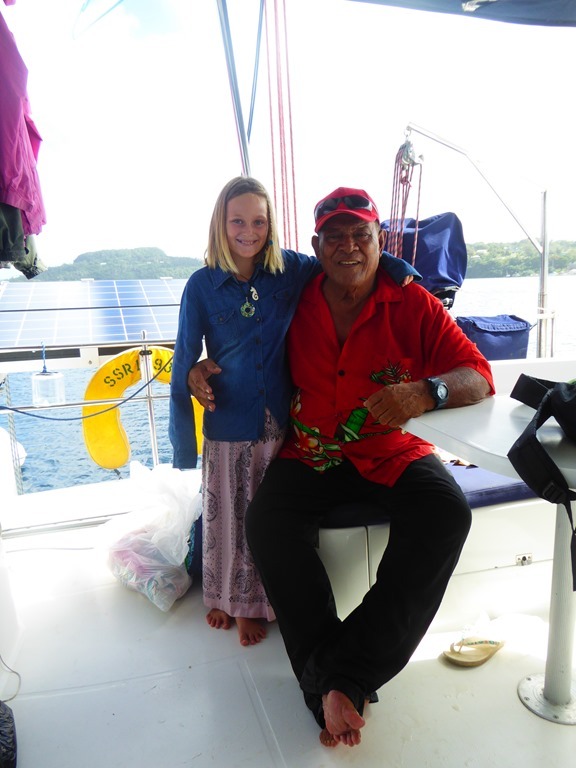 We met a lovely little girl called Paige from a NZ boat up for the season called Ika Moana that day who invited everybody to her boat for her 8th birthday party. Baking was done (cupcakes and Lemon Drizzle cake) and there was a lot of fun involved which included using a spinnaker pole as a swing and an awful lot of screaming. The day ended with some crap US High School Musical that enthralled the kids on Be and Be. I rather think Paige enjoyed herself. With our need to get to Fiji and with a high projected to sit on us, we decided that we didn’t want to wait and get left with no wind. We wanted to go on Mon 5th but had to stay for the festivities of Independence Day as everything was closed, including all government functions. Leaving Tues 6th meant one more night in Port Maurelle and a final chance to leave gifts for Dylan and Harry’s impending birthdays. Blackmail and peer pressure not withstanding (Frans – looking at you, bud. Boy, you are good at it!) 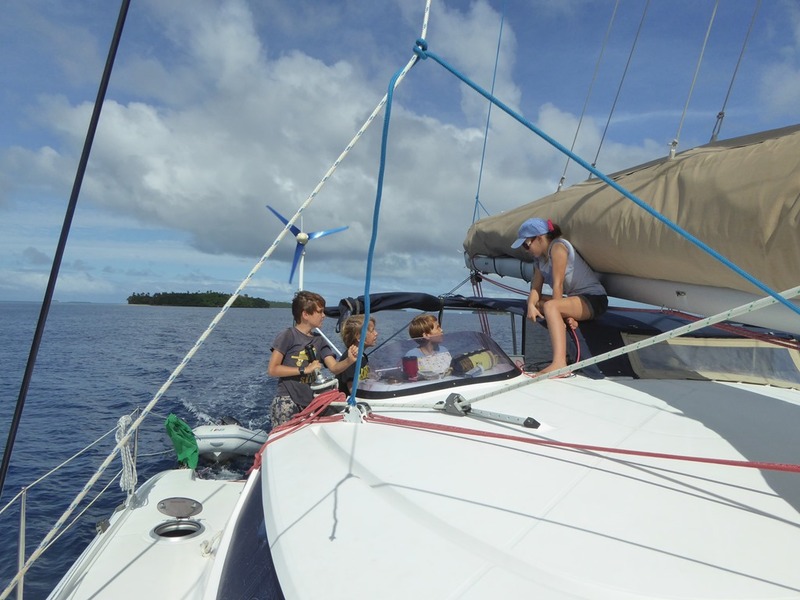 we decided we had to leave to make sure we reached Fiji before the weekend when the wind was expected to fail. 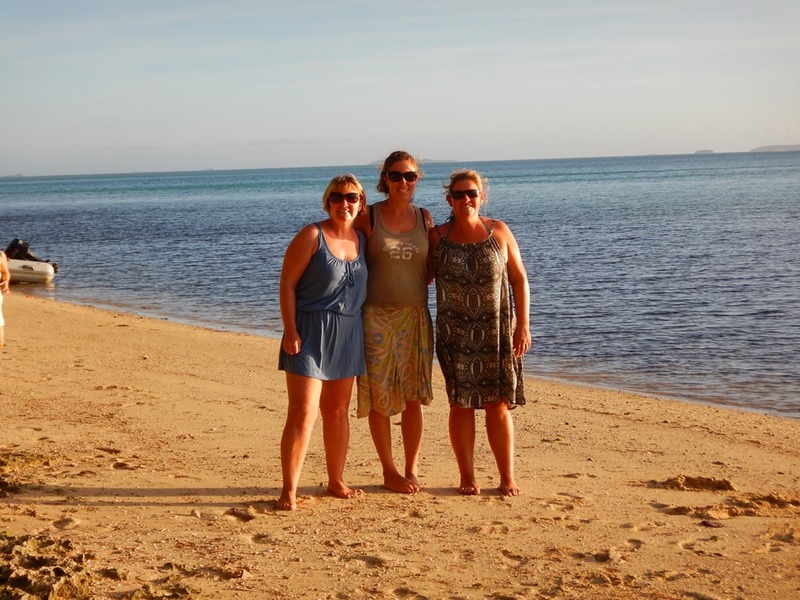 Tonga has been great fun. 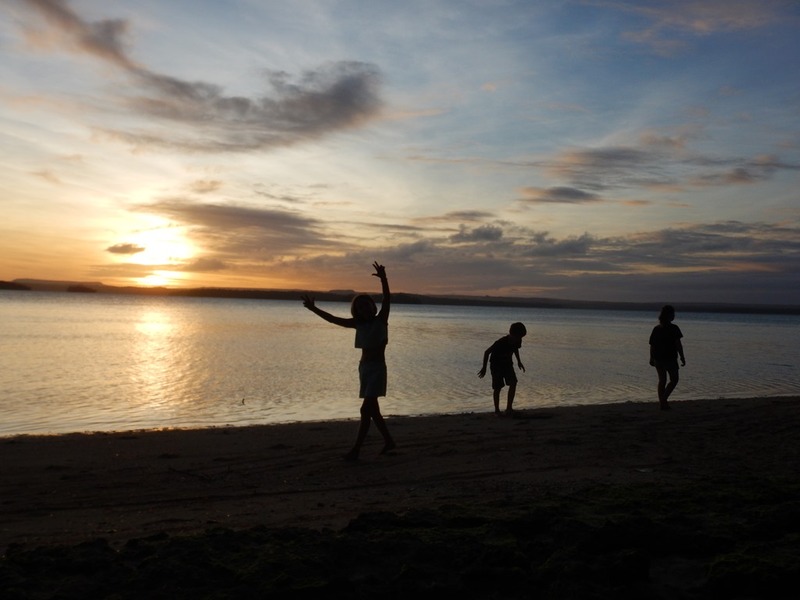 It has been lovely to explore it in the company of the kids boats of Be and Be and Sangvind and a surprise to find ourselves in and around more boats than at any time since Nuka Hiva last year. Everyone seems to be on the move again, be it with a rally or as one of the boats appearing from NZ. The season has properly started. The Vava’u Group of Tonga is a beautiful cruising ground and the best description I can give you is a greener, less civilised BVI. The anchorages are good but often deep, the reefs beautiful (as long as you are careful) and the water flat and protected. It is a magnificent sailing ground. I am surprised there isn’t a bigger cruising fleet here. Saying that, I don’t think I would really want to spend lots of time here. 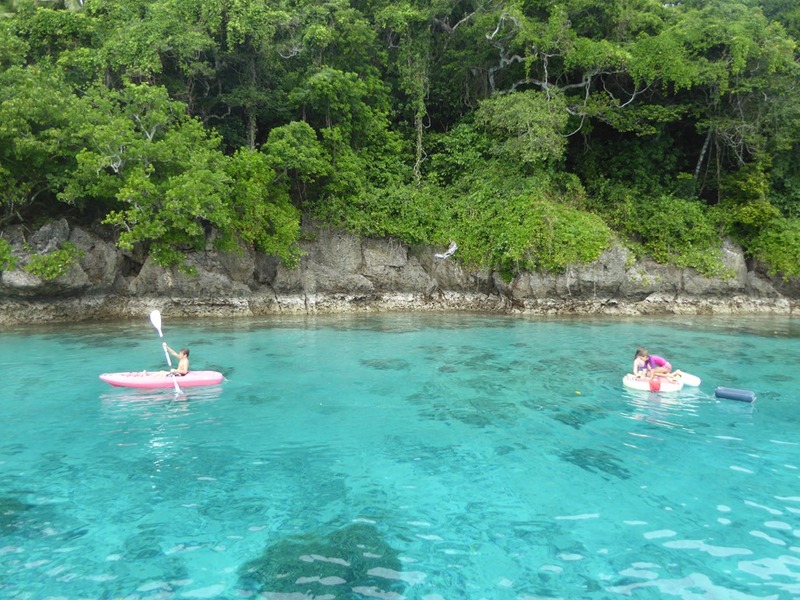 I need the mix of land and sea and Tonga has very little to offer in the way of land based activities and amenities. Perhaps if we had visited the main island group to the S, I’d think differently but the general feel from cruisers I have spoken to is that a couple of weeks here is enough. Finally, Shena and Kinsley – days to do! Really looking forward to seeing you both.